Although many visitors come to Barbados for the sunshine, one of the most popular attractions on the island is completely hidden from the sun. Harrison's Cave is a geological feature in Barbados' central highlands. In it are natural formations recalling abstract works of art. A visit i provides an unusual contrast to the run of the mill island experience. Barbados rests upon a foundation of limestone created over the millennia by coral deposits. Water running through the limestone has eroded it forming cave systems. Harrison's Cave is named after the 18th century landowner who owned most of the land in the area where the cave is located. There were attempts to explore the caves in that era but they did not get very far as the natural passages were not easy to traverse. In the 1970s, Ole Sorsensen, assisted by Tony Mason and Allison Thornhill, entered the cave through its narrow natural entrance. They explored, surveyed and mapped the cave. This eventually led to a decision by the Barbados government to develop the cave as a tourist attraction. It opened to the public in 1981. The government created a large complex around the cave. 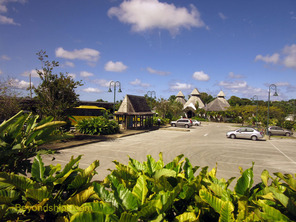 Level with the surrounding countryside is a parking lot for tour buses and private cars as well as the Visitor Centre. This building houses the ticket office, a shop, a refreshments stand, an exhibit area and a bank of elevators that descend down into a gorge at the back of the entrance building. At the bottom of the gorge is a nicely landscaped area that includes several kiosks as well as an interpretation center. You enter the caves through the interpretation center. Visitors are given numbers and when your number is called you board an electric tram, which takes you through the cave. In order to make the cave accessible to the public, the limestone has been carved into tunnels wide enough for the trams. As a result, the experience is somewhat reminiscent of exploring the tunnels that have been carved into the Rock of Gibraltar (see article). The tunnel connects a series of natural chambers ranging in size from a few feet high to the Great Hall, which soars upwards some 50 feet. These chambers are filled with stalactites, stalagmites and other rock formations that have been created over the centuries by the slow drip of mineral infused water. Dramatic lighting enhances their other-worldly beauty. In addition to the crystallized rock formations, some of the chambers have water features. Running streams, still pools and even a small waterfall provide a counterpoint to the rocks. Looking at the narrowness of some of the chambers, some of which are partially flooded, the cave explorers must have had a great deal of courage to squeeze themselves through. Today's visitor, of course, rides in comfort on the tram. In addition, the tunnels are quite large and do not lend themselves to claustrophobia. A guide gives a running commentary as the tram proceeds through the cave. At various points the tram stops so that the visitors can get a better look at some feature. Also, in two of the larger chambers, the tram stopped and the visitors were able to walk around. The tram tour lasts about an hour. Following the tour, visitors line up to take the elevators back up to the Visitor Centre. There can be something of a wait here depending upon the number of groups who have been exploring the cave and on the number of elevators that are working. An alternative is to walk up the service road. About half way up the hill is a set of steps that take you to the Visitor Centre. Along the way are various specimen plants and trees with identifying labels. Most people, however, prefer to take the elevators. 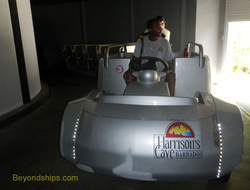 Harrison's Cave is open to independent travelers as well as to people on shore excursions. However, it is a very popular attraction and on days when several ships are in port, it may be a long wait to enter the cave. In addition to the tram tour, Harrison's Cave offers several other tours including an eco-adventure tour and a walk-in tour. For more information see the Cave's official website.